What do we wish most for our children? Next to being healthy, we want them to be happy, of course! Fortunately, a wide array of scientific studies show that happiness is a learned behavior, a muscle we can help our children build and maintain. 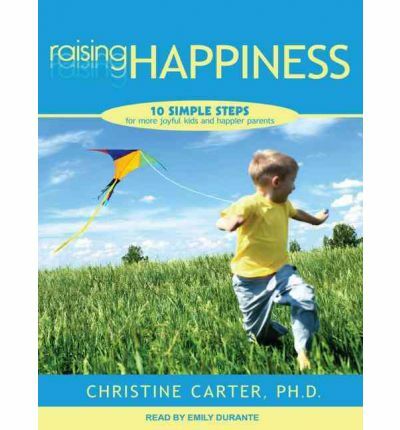 Drawing on what psychology, sociology, and neuroscience have proven about confidence, gratefulness, and optimism, and using her own chaotic and often hilarious real-world adventures as a mom to demonstrate dos and don'ts in action, Christine Carter, Ph.D., executive director of UC Berkeley's Greater Good Science Center, boils the process down to 10 simple happiness-inducing steps.With great wit, wisdom, and compassion, Carter covers the day-to-day pressure points of parenting how best to discipline, get kids to school and activities on time, and get dinner on the table as well as the more elusive issues of helping children build healthy friendships and develop emotional intelligence. In these 10 key steps, she helps you interact confidently and consistently with your kids to foster the skills, habits, and mindsets that will set the stage for positive emotions now and into their adolescence and beyond. You will discover: the best way avoid raising a brat changing bad habits into good ones tips on how to change your kids' attitude into gratitude the trap of trying to be perfect and how to stay clear of its pitfalls the right way to praise kids and why too much of the wrong kind can be just as bad as not enough the spirit of kindness how to raise kind, compassionate, and loving children strategies for inspiring kids to do boring (but necessary) tasks and become more self-motivated in the processComplete with a series of "try this" tips, secrets, and strategies, Raising Happiness is a one-of-a-kind resource that will help you instill joy in your kids and, in the process, become more joyful yourself."